Project 03160 “Raptor”. Picture from Pella Shipyard. The internet seems to differ whether the boat is in fact a licensed version of Dockstavarvets Combat Boat 90/Stridsbåt 90, or if it just “happens” to look like one. 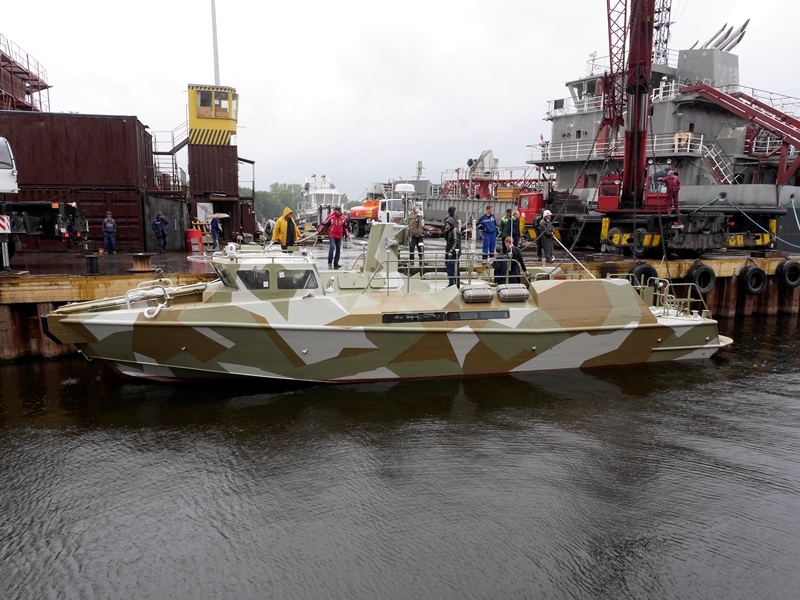 However, what is certain is that Dockstavarvet sold a number of its Interceptor Craft 16 M, a patrol craft based on the CB 90 concept, to the Russian border guards (FSB). The Raptor, however, seems to be based on the original CB 90 instead of the IC 16 M, and it is clearly stated that this time the customer is the Russian Navy, with at least four boats slated for the Black Sea Fleet. The armament is rather interesting, with a single remote weapons station with EO-sights and a single 14,5 mm heavy machine-gun. The “Range of target detection – 3000 m” is a value which naturally doesn’t tell us anything, as there is no mention of what kind of target and environment this corresponds to. The back-up weapons are two pintle-mounted PKP light machine guns, which is a somewhat strange choice. The PKP, or 6P41 “Pecheneg”, is a development of the PKM, and mainly differs from this in having a non-replaceable air-cooled barrel, and an integrated bipod, and as such is marketed as a dedicated squad-support weapon. Whether the Raptor mounts the baseline version, and actually retains the bipod, or not remains to be seen, but this could be an indication that the Russian marine infantry is about to ditch the PKM completely in a relatively near future (another alternative, naturally, is that the PKP is simply listed by the yard as a marketing trick, but that in service the boats are fitted with the PK-derivative that is closest at hand when sailing). All in all, a quite solid, but not overly heavy weapons fit, which should provide ample opportunity to “intercept and arrest […] small targets”. The inclusion of ballistic protection, at the expense of weight, and thereby speed and agility, adds to the feeling that the Russians expect the boat to operate on the battlefield where small arms fire (both own and incoming) can have an effect on target. This could well be not only close to the shore, but also in riverine conditions. The role of the boat seems to be accurately described on the home page. Key focus is on transporting an assault force, with a secondary anti-shipping/anti-surface capability (or as a patrol vessel in peacetime). Looking at the camo scheme, it does feel more suitable to the inland waterways of south and central Europe than to the coastlines of the Baltic Sea, but this might just be my prejudices about how a “proper” boat pattern should look if it is to fit in in the Gulf of Finland. Is the boat then a copy of the CB 90. If it is unlicensed, I believe the answer is ‘No’. The general layout certainly seems copied, but it is hardly revolutionary. Pella might have borrowed more than is considered “fair”, but the general characteristics of the CB 90 is conventional enough. To try and reverse engineer the details of the CB 90 would probably not have been worth the hustle. To begin with, Pella would have to send a number of engineers to a boat and measure it up, down to what size the bottom stringers are and how high the masthead light is, as well as document every little detail of the equipment. After this, the engineers would have to create the whole drawing package from scratch, after which they would have to adopt it to Pella’s materials and standards. What is the size of the Swedish chairs? Does Pella’s standard choice fit? What can be used instead? How is the Russian ballistic protection attached, compared to the original? Simply using a proven general layout, and starting an own design from there, is far faster than “true” reverse engineering. And I think speed is the issue here. Projecting boats from the keel up is a long process, even when it is a relatively small and straightforward one as the Raptor. Going through all the normal stages, with a preliminary round of tenders, choosing a winner, nailing down the details of the design, producing and testing a prototype, building a pre-production run, and then finally going into series production, usually takes at least a few years. Here it seems like the first steps have been skipped, and the project jumped straight into the detailed design phase. The result is a stop-gap vessel, built to expand on current capabilities (and numbers), rather than revolutionize them. This also fits the general trend of rapid expansion of the Russian armed forces. When the pictures first surfaced last spring, Dockstavarvet’s CEO K-A Sundin strongly denied any involvement, and stated that Pella apparently on their own have gotten their hands on “some material” and created a clone. Has it been confirmed that the comment used to verify that Dockstavarvet isn’t involved indeed was posted by K-A Sundin? Not as far as I know, but it sure sounds like him (might be that he signed in with work e-mail, but you would have to ask Observationsplatsen about that). Rumors say, that project was bought from some U.K. design company. That’s interesting, do you know of any web pages where these rumors are discussed? Could they outsource the reverse engineering part?